Sligo Grammar School aims to deliver an all-round education to its students. We value all activities, sporting, cultural, community and academic. We understand that not all students are the same and so we like to encourage students to pursue their own particular talents. We strive to deliver an excellent academic education and many of our students have excelled in many areas of academia. The subjects we offer can be viewed by going to our subjects page. Once more this year Sligo Grammar School Leaving Cert. students have produced a fantastic set of results. As a group they scored very high points, way above national averages. As well as doing so well with regard to Leaving Cert results, our students did very well with regard to third level places. A huge 64% of the Class of 2017 were offered University places both at home and abroad. The breakdown of both points scores and University and 3rd level places can be seen in the tables here. Repeating Leaving Cert . All were offered places on the strength of their 500+ points but wish to try for more points so as to get the course they want. Post Leaving Cert Courses. These students include some who have deferred University places for a year in order to further their studies in Art and Music before taking up their University place. On a gap year during which they will work and think aboutwhat area of study they want to pursue at 3rd level next year. When we look at these statistics is clear that the so-called “definitive” league tables published in the National newspapers are far from correct. The make no mention of the many students who go to Universities in the UK and abroad. Their achievements are completely ignored. If this misrepresentation is true of our school, you can be sure it is also true of many schools around the country, especially those which are not close to University Cities. Sligo Grammar School is justifiably proud of their 2017 Leaving Cert students and we wish them well in their future studies. In the 2016 Leaving Cert exams our students achieved an average points score of 429, with 28% of students achieving 500 points or more. This year 94.1% of Sligo Grammar School Leaving Cert. students progressed to further education both in Ireland and abroad. In 2016 alone, University Scholarships were awarded to five students, two receiving Trinity College Dublin Entrance Exhibition Awards, two receiving University College Dublin Entrance Scholarships and one receiving an Academic Scholarship from Dublin City University. Academic achievement is evident throughout the school. Conall O’Dwyer was awarded two Junior Cert awards for excellence in the Junior Cert exam. 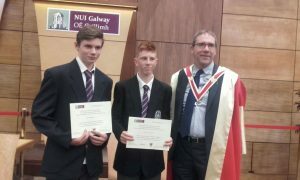 He was identified as a High Achiever in Science and Maths by the State Examinations Commission and together with his classmate Conor Grennan was also presented with the Business Excellence Award by Mr Tom Acton, Dean of Business in NUIG, as a result of their excellent grades in the Junior Cert Business Exam. 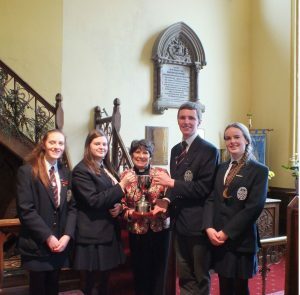 In October Irish students Andrew Wood-Martin, Leah Wasson, Sara Bourke and Rachel Carter won the Bedell Cup, a National Award for their work on Seachtain na Gaeilge last March. 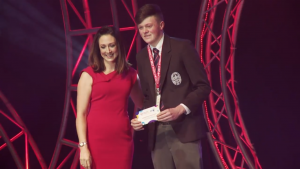 Just this month, 5th yr student, Paddy Bird, was awarded third prize in the Senior Physical, Chemical and Technology category of the BT Young Scientist and Technology competition.